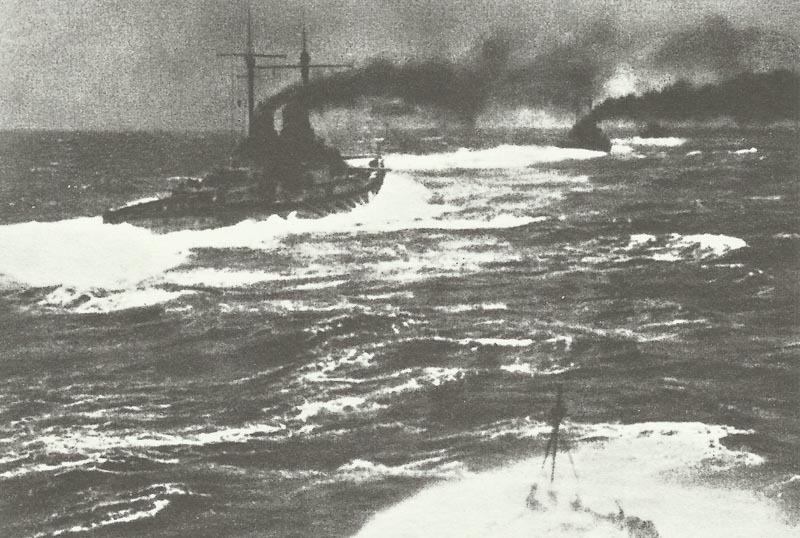 Warships of the German High Sea head out into the Battle of Jutland. The fleets weigh anchor and steam to battle on the Jutland Bank. Following 2 years of shadow boxing, the spring of 1916 spotted both largest fleets on the planet on the water and steaming in the direction of the other. Whenever they got together, then a battle distinct from every earlier battled could be anticipated. The spot of the action was Jutland Bank; the day May 1, 1916. In the following 48 hours some Twenty-five ships were to be sunk, along with nearly Nine Thousand seamen killed on both fleets. The British ships together have 1,850 guns of all calibres, including the heavy artillery of 48 × 15-in, 10 x 14-in, 142 × 13.5-in, 144 x 12-in and 36 × 9.2-in. 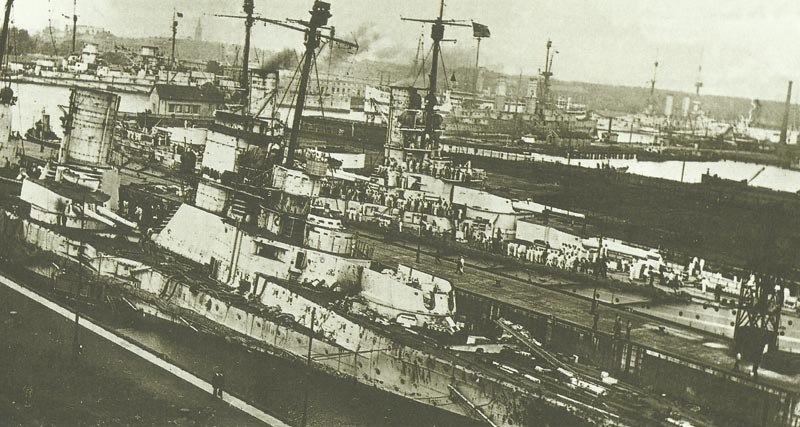 The German ships together have 1,194 guns of all calibres, including the heavy artillery of 144 x 12-in and 100 × 11-in. Meeting of British Naval Officers. Left foreground ir Beatty who led the battlecruisers fleet at Jutland, and far right Jellicoe, who was C-in-C at Jutland. British commander-in-chief John Rushworth Jellicoe. Flagship of the Grand Fleet ‘Iron Duke’. The British Grand Fleet head out into the North Sea. 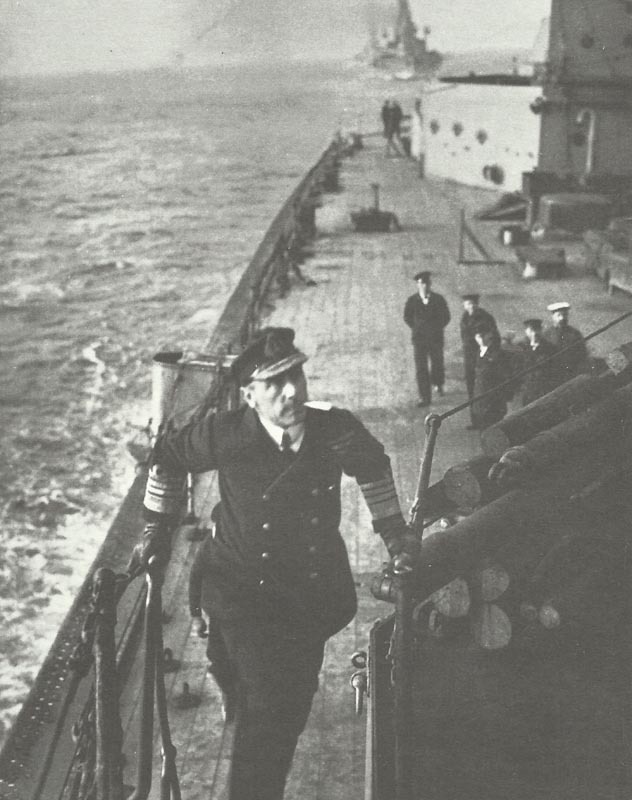 Admiral Sir David Beatty on ‘Lion’ at sea prior to the battle of Jutland. ‘Lion’ class battlecruisers at sea prior to the battle of Jutland. ‘Princess Royal’ and ‘Lion’ were both damaged during the battle, but even then escaped the fate of their sister ship. ‘Queen Mary’ was hit forward and in Q magazine led to an explosion that took the ship. Battleship ‘HMS Malaya’ of the 5th Battle Division. Admiral Reinhard Scheer, C-in-C German High Seas Fleet. Flagship of German High Seas Fleet ‘Friedrich der Grosse’ (Fredrik the Great). German battlecruiser ‘Derfflinger’, which sunk *Invincible’ at Jutland. Torpedo boat next to a battleship of the 1st Battle Squadron of the German High Seas Fleet en route to Jutland. 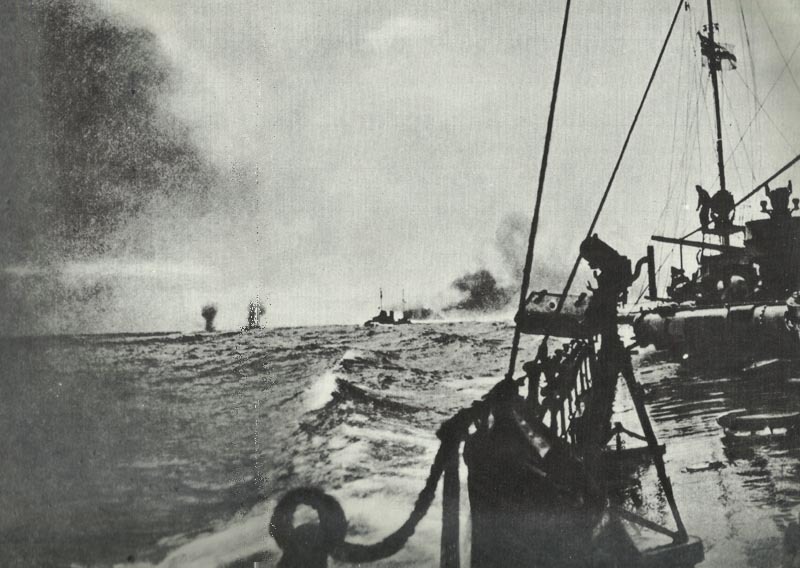 Destroyers of German High Seas Fleet in the North Sea. Fatally wounded, with the gun’s crew dead and dying around him, Boy 1st Class John Travers Cornwell (aged 16) remains at his post on ‘HMS Chester’ during the battle of Jutland and earns a posthumous Victory Cross. The first British shells arriving between the German ships of the Scouting Group. At 1420 hours on May 31, 1916, the Royal Navy light cruiser HMS Galatea showed the ‘enemy in sight’ signal and, together with her colleagues, proceeded to attack Ger­man light ships which had halted a neutral freighter. The RN ships were attached to Admiral Beatty who, with 6 battlecruisers and 4 Queen Elizabeth class battleships, right away arrived to support. But the German light vessels also owned strong assistance in the kind of Admiral Hipper’s 5 battle­cruisers: these as well encountered in, sighting Beatty at 1520 hours. It had been a wonderful, if hazy, spring afternoon and the location just west of the Jutland Bank. The largest, greatest and most controversial of sea battles was ready to begin. Hipper was basically out to be observed, his job being to attract out a significant Royal navy squadron, ideally Beatty’s, and steer it back into the hands of the main body of the High Seas Fleet for termination. This body, arranged around Sixteen battleships and 6 pre-Dreadnoughts under the general control of Admiral Scheer, was fol­lowing some 50 miles towards the south, and if as planed Beatty moved to cut Hipper off from Germany, he would find himself definitely trapped between a couple of guns. 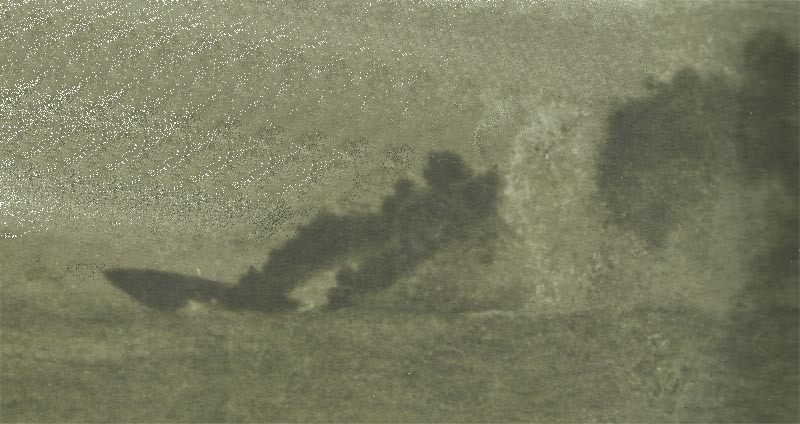 This picture was taken from the light cruiser ‘Birmingham’ at about 1600 hours and shows the hazy conditions accentuaeted by funnel and gun smoke. Beatty’s battlecruisers are to the right and the Fifth Battle Squadron under fire from Hipper, to the left. 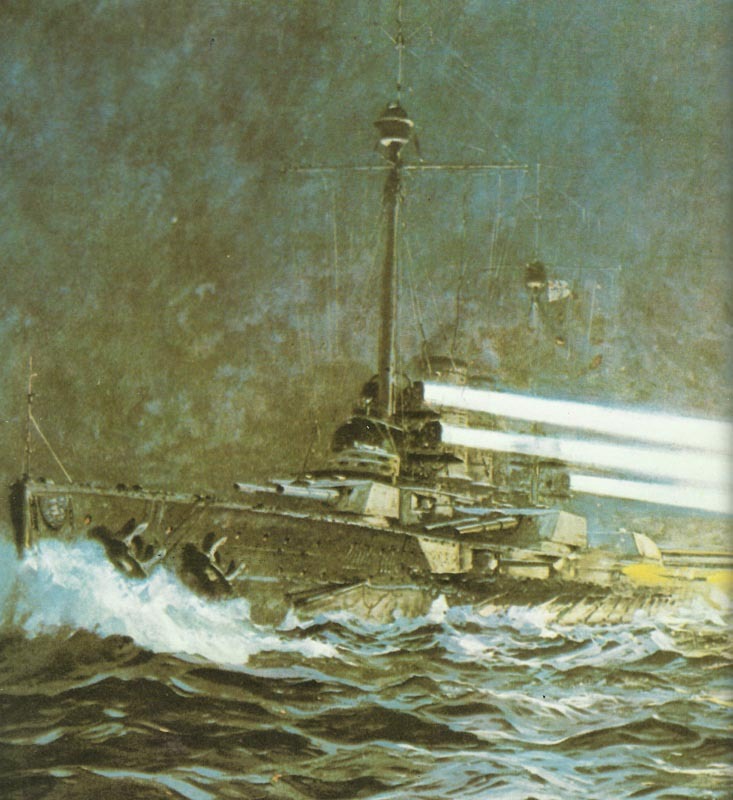 Sadly for German strategies, a lot of their schedule radio traffic had been reviewed and decoded by the British who, along with sufficient warning of an upcoming operation, had also sailed the entire accessible power of the Grand Fleet commanded by Admiral Jellicoe, whose Twenty-four battleships had been around 70 miles to the north of Beatty. For now, as they closed each other, not one battlecruiser commander had been informed of the existence of these massive fleet concentrations. It had been 1548 hours until the enemy forces exchanged fire, the haze not enabling the Royal navy to fire at a greater range of their bigger artillery, Hipper manoeuvred to have the ranges limited, the paths parallel and the course southward in the direction of Scheer. British battlecruiser ‘Indefatigable’ sinks after being hit by the German battlecruiser ‘Von der Tann’. His firing was fast as well as precise and, at 1602 hours, battlecruiser HMS Indefatigable at the end of the Royal navy line was affected by 3 multiple strikes, struggled with a blast and started to settle aft. One minute afterwards she got one more salvo ahead and diminished in an enormous magazine blast. In a few minutes, the slower new battleship HMS Queen Eli­zabeth had hurried within range, and her forward 15-inch guns started to penalize the end of the German battle line. British battlecruiser ‘Queen Mary’ disappears in a cloud of smoke after being hit by shells from the German ‘Derfflinger’. Beatty impetuously attacked to close further and paid the charge at 1626 hours, when the German gunners located battlecruiser HMS Queen Mary: a number of hits amidships occurred most likely in flash penetrating right down to ‘Q’ turret handling room and magazine, the vessel splitting in two in a number of enormous explosions. HMS Lion, Beatty’s flagship, had barely missed an identical fate when hit at 1600 hours. 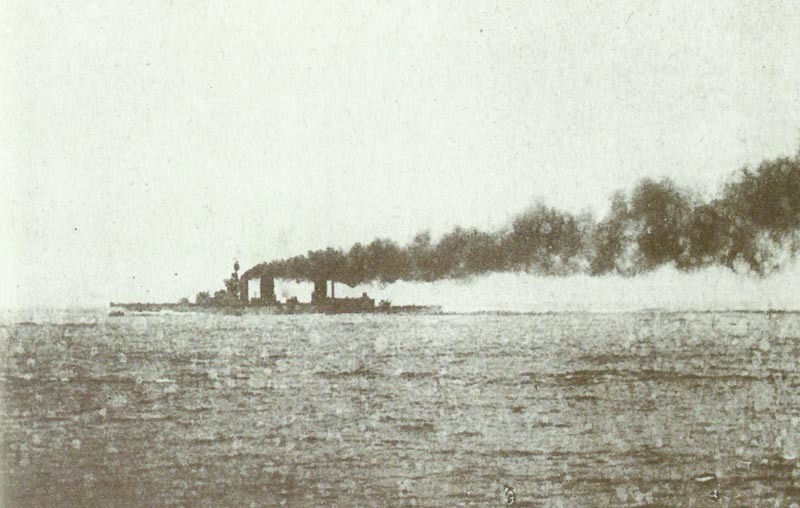 ‘Lion’ is steaming at full speed during the battle of Jutland before receiving the near-disastrous hit on ‘Q’ turret. Right prior to the fate of the Queen Mary, each Beatty and Hipper had ordered destroyer torpedo strikes on the other to reduce pressure. Under this fresh hazard, Hipper broke off the battle briefly at 1636 hours by a turn to THE eastward. At this point, nevertheless, the Light cruiser HMS Southampton, commanded by the notable Commodore Goodenough, positioned a bit in front of Beatty, spotted the lead warships of Scheer’s main body arriving up from the south. Hipper had carried out his task per­fectly and the stage was at this point Beatty’s. 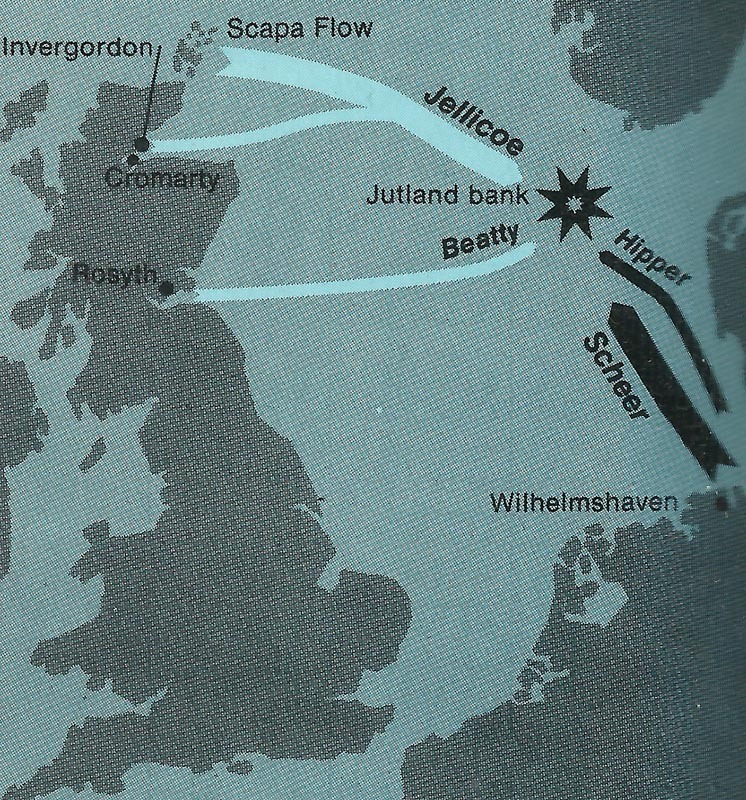 Despite the fact that shocked by the moving armada, Beatty didn’t delay to be destroyed, rotating on his heel at 1646 hours and choosing the fastest course to Jellicoe’s location, at this point some 50 miles towards the north-west. Beatty had now ended up being the lure, the options for serving up the unaware Scheer, right now in joyful entire cry, into the thankful arms of the Grand Fleet. To perform this successful­ly, he had either to stay alive as well as guarantee that Hipper’s marauding battlecruisers didn’t spot Jellicoe too soon. Beatty’s joined battleships were some­what late in carrying out the 16-point turn however, falling in astern, protected his rear and, between 1650 hours and 1730 hours, made good effect on the Germans, inflicting Twenty hits for just Thirteen in exchange. Hipper continued to be tenaciously in touch with Beatty, the bad view which restricted their exchanges steadily boosting in preference to the latter who, with the decreasing sun behind him, succeeded in pressuring an opponent disengage­ment at 1751 hours. By switching away, nevertheless, Hip­per encountered problems in running straight into a brand new adversary in the kind of Rear Admiral Hood’s 3rd Battlecruiser Squadron however suc­ceeded in rotating south-west and earning sanc­tuary at the head of Scheer’s High sea fleet, which was directing about north-east. The time was 1810 hours and, between them, Beatty and Hood had pre­vented the greatly penalized Hipper from spotting Jellicoe’s Grand Fleet. Admiral Sir John Jellicoe, commander of the British Grand Fleet at Jutland. No more than 12 miles at this moment lay between SMS Koenig at the head of the German line from HMS Marlborough, the nearest of Jellicoe’s bat­tleships. These were steaming in 6 parallel columns of four battleships each and required to be deployed into a battle line straight away. This man­oeuvre would take a minimum of Fifteen minutes and also had to be accurate very first time. Jellicoe was uncertain due to a lack of trustworthy details on the German High Sea fleet’s speed, bearing, and deployment. At this moment at 1814 hours Beatty, in the quickly nar­owing space between both fleets, made con­tact, the Marlborough spotting his gun flashes. Jellicoe acted quickly, deploying into battle line on his port column, directing to the east with the port column leader HMS King George V at the front of himself, in the flagship HMS Iron Duke, being 9th in the line. At 1830 hours Hood’s flagship ‘Invincible’ was leading the British line as it forced the head of the High Seas Fleet around to the eastward. At 1833 hours, under fire from about five German ships at short range, she was heavily hit on ‘Q’ turret amidships. This is the roaring inferno of the magazine fire that preceded her fatal explosion. With the Queen Elizabeth providing up the rear, the Grand Fleet displayed a powerful wall of guns some 6 miles in size, and not a minute too soon, Even as they manoeuvred in place, the Queen Elizabeths’ of the 5th Battle Squadron spotted the German battle line at close range. They got heavy fire, at which moment HMS Warspite‘s helm jammed, resulting in the ship to move a pair of full cir­cles and to suffer thirteen large-calibre hits. 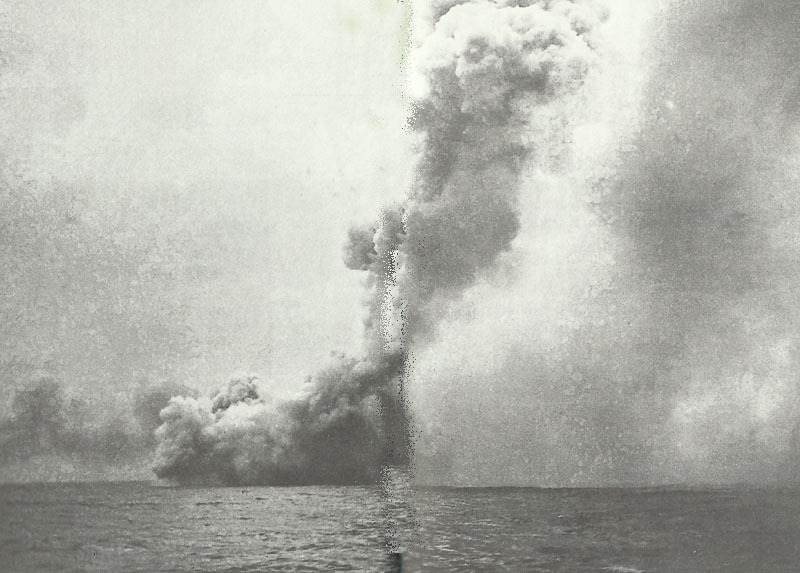 At the head of the British line, Beatty and Hood were once more dealing with the opponent when HMS lnvincible was hit, exploding even as had the other 2 battlecruisers prior to her. As Jellicoe’s fleet turned to starboard by divisions at 1855 hours following Scheer’s ‘battle turnaway’, the ‘Benbow’ passed this scene. Her crew cheered, assuming the wreck was German, but it was that of ‘Invincible’, destroyed 20 minutes earlier. Only 3 survivors were rescued by the destrpyer ‘Badger’ on the right. The British line had, at this point, successfully ‘crossed the enemy’s T’ and was delivering an incredible fire into the head of Scheer’s line, which was in an inadequate situation to answer. At 1833 hours, for that reason, Scheer risked all with a synchronised 16-point turnaway; peace­time exercise paid off as, without having collision, the German line simply dissolved from the eyesight of the British gunlayers. Jellicoe’s battle line swung to the south-east by divisions and might have missed the Germans, who were heading westward, but for the tenacity of Goodenough’s scouting cruisers. The fleet action between 1815 and 1835 hours. Scheer had manoeuvred into the worst possible situation for a fleet action. Only by ordering a simultaneous ‘about turn’ he could escaped. Probably not really admiring his advantageous situation, Scheer at this point unexpectedly once more flipped 16 points, running straight at the British who, with the gloom at their backs, made the best of their opportunity, causing around Thirty-five rapid hits vir­tually without respond. The heavy damaged German battlecruiser ‘Seydlitz’ on fire. Hipper’s flagship Lützow had forced to retire with critical damage, but Scheer dispatched the remainder 4 battlecruisers, currently sev­erely damaged themselves, on a suicidal attack at Beatty, synchronized with a des­troyer assault. 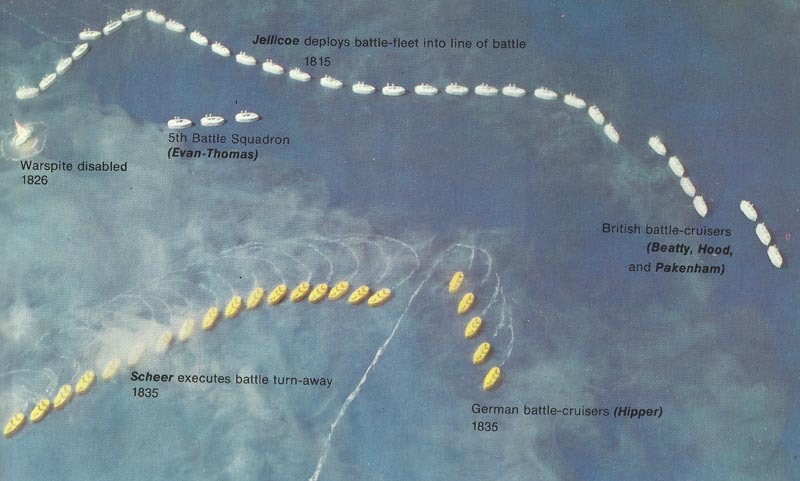 These distractions have been effective and, as Jellicoe turned away in front of the risk of the torpedoes, Scheer managed to execute a 3rd about-turn. 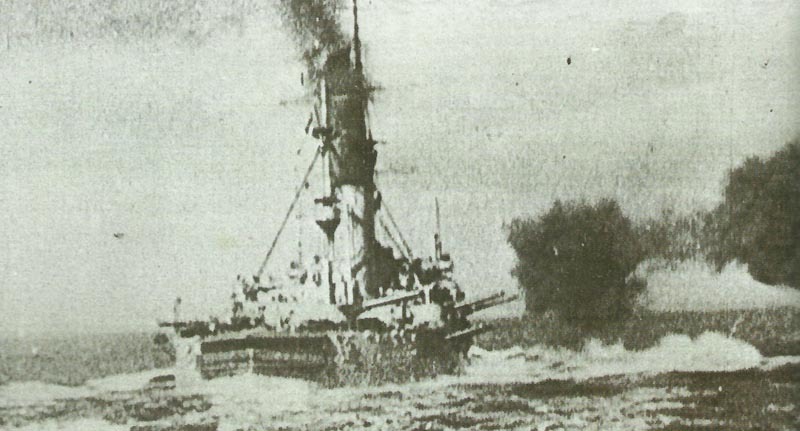 A ‘Nassau’ class Pre-Dreadnought fires a salvo from her amidships guns. Though six turrets were included in the design, only four could bear on either beam. The four ‘Nassau’ class ships formed the 2nd Battle Division at Jutland but, being elderly, were positioned well back in the line. Minimal sunlight remained and the Grand Fleet had become disengaged, between 1935 and 2000 hours, the British fleet really intentionally returning around onto a westerly course. Sunset was at 2019 hours and the German High Seas fleet was in a ragged line head­ing southward for the Horns Reef channel and Germany. The battlecruisers remained in contact, and Beatty started to present eagerness at Jellicoe’s obvious deficiency of urgency in making a choice by cutting off Scheer’s line of retreat. Even as Hipper’s vessels turned out to be small however darkish silhouet­tes, Beatty stayed, pushing him hard. Jellicoe didn’t like a night battle, which would discard his numerical edge on a chancy encounter for which the Germans were, whatever the case, superior skilled. At 2045 hours, when a cruiser informed the British lead vessel, King George V, that german battleships were just 5 miles well away, the contact wasn’t prosecuted for the reason that they were likely Beatty’s battlecruisers. The British admiral prepared his night disposi­tions in the thought that Scheer couldn’t move across his bows and would be avoided from traveling astern through his stationing there of massed destroyer flotillas. Battle could be re­sumed at daybreak. The German battleship ‘Thueringen’ in night action on May 31 to June 1, at Jutland. Scheer didn’t collaborate, his battle line moving gradually through Jellicoe’s light forces. These struggled bravely and at great sacrifice however in vain; without having major warships they couldn’t stop the germans flooding through. Really amazingly, these furious fightings had been noticed by the end of the British battle line, the battleships neither intervening nor informing Jellicoe of what had been happening. By 0100 hours on June 1 Scheer had broken through and, despite the fact that still tested by light forces until 200 hours, not anymore had the Grand Fleet athwart his way to Germany. Around 300 hours the Iron Duke turned about. The Battle of Jutland was over. Damage inflicted on the German battlecruiser ‘Seydlitz’ in the Battle of Jutland. The Royal Navy had lost 3 battlecruisers, 3 armoured cruisers as well as 8 destroyers to a German pre-Dreadnought (by torpedos during the night action), a scuttled heavily damaged battlecruiser, 4 Light cruisers and 5 destroyers or torpedo boats. Crew losses were 6,100 British to 2,550 German killed. 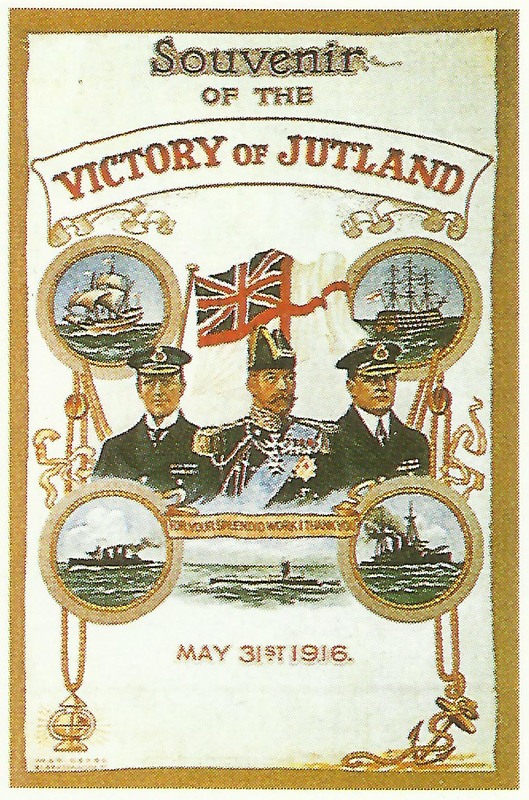 German propaganda celebrating the ‘victory at Jutland’. 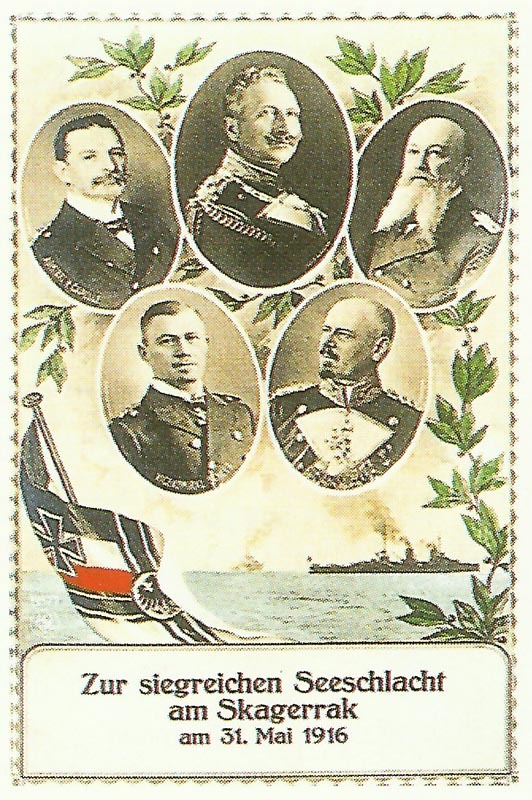 The heroes are depicted along with the Kaiser. The British celebrate in the same way their ‘victory of Jutland’. Nevertheless, the victory that the Germans claimed was worthless for, tactically, no beaten fleet ever pursued a victor back to harbour and, strategically, the situation at sea had not improved. But of course, if an outnumbered force inflicts more casualties on the stronger one and isn’t wiped out, it’s for sure a great success. And additional, the original goal of the German fleet operation was also successful: to destroy are large number of British cruisers or ballecruisers. 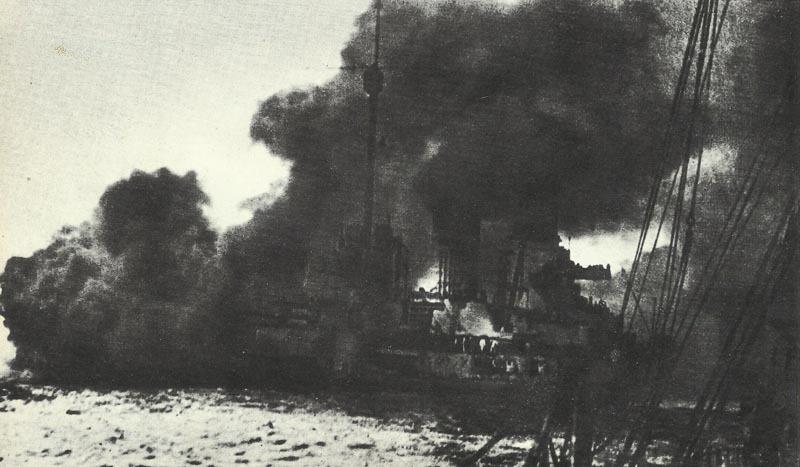 British gunnery had been the higher quality, a lot more German vessels being seriously damaged, but the High Seas ships survived because of their superior design, because a higher propor­tion of their displacement had been dedicated to pro­tection as well as due to the fact British shells seemed to explode on contact instead of on penetration. 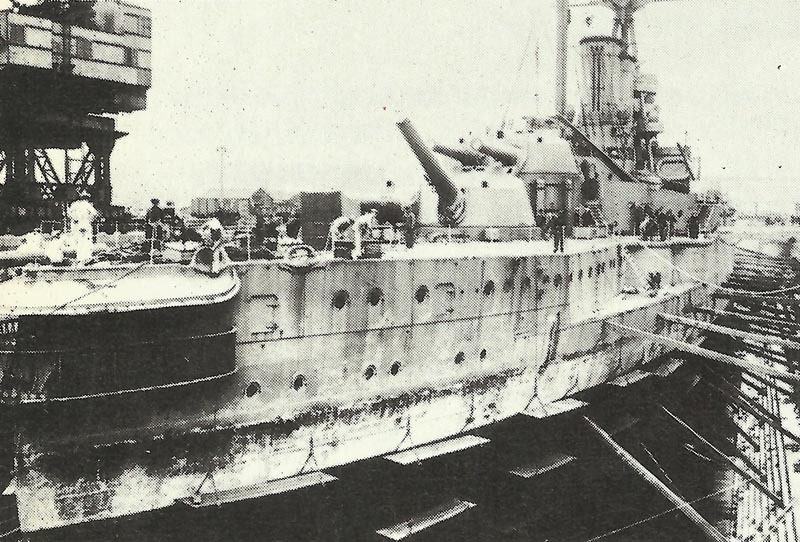 Damaged battleship ‘Warspite’ laid up in dry dock. During the battle, the Germans showed good use of their knowledge of British challenges and reactions. While the British light forces held fire through insufficient positive enemy identification, the Germans would instantly overwhelm them with searchlights and gunfire. Additionally they bluf­fed to good effect, saving a number of damaged vessels thereby. Lousy British leadership that night was applied. It has been said the Jellicoe, cautious and heavily aware of his responsibilities, ‘fought to make a German victory impossible rather than a British victory certain’. That about sums it up probably. ‘Pommern’ was one of 6 German prea-dreadnought at the Battle of Jutland. She was sunk with all hands by a torpedo from the Britiosh destroyer ‘Faulknor’ in one of the last night actions. ‘HMS Warrior’ was the lead vessel of a class of four armoured cruiser an was lost at Jutland. The British armoured cruiser ‘HMS Black Prince’ was hit at night at Jutland by 21 German shells, 15 of the from heavy guns, and sank with all hands. Did the Battle of Jutland Really Matter?